Overclock.net > Cooling > Specialized Cooling > Dry Ice/ Liquid Nitrogen > EPDM O-Ring for KP Venom POT/DICE Working. EPDM O-Ring for KP Venom POT/DICE Working. Tested to ensure the material doesn't degrade and seals. Put 1 O-Ring in acetone for 48 Hours straight. No degradation. Also tested by using it on my Venom POT, filled with Acetone and chilled with DICE. 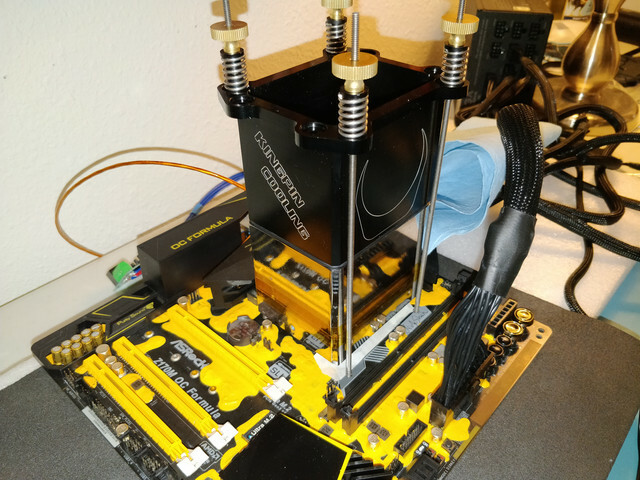 Spend 2 hours at ambient temps with no leaks. Spend 1 hour at -78C with no leaks. Any spills on the container in the pictures is from me making a Volcano dumping DICE too fast. This is the link to the O-rings I bought. It's a 20x pack so there's a ton left over. I'm mailing 3 to Kryton to test on his pot as well. If anyone has both a Venom and T-Rex, can you verify if it's the same dimensions for the Base/Top? And I'll be looking for those and doing further testing myself. I wonder about compression with high socket tension. When I bench these pots I fully max out the kingpin springs for better results and a thinner TIM layer. What would happen if you maxed out the KP springs with this O-Ring? Does the pressure cause distortion or seal failure? I have both versions of T-Rex and the classic Venom like yours. Happy to provide whatever measurements you need. 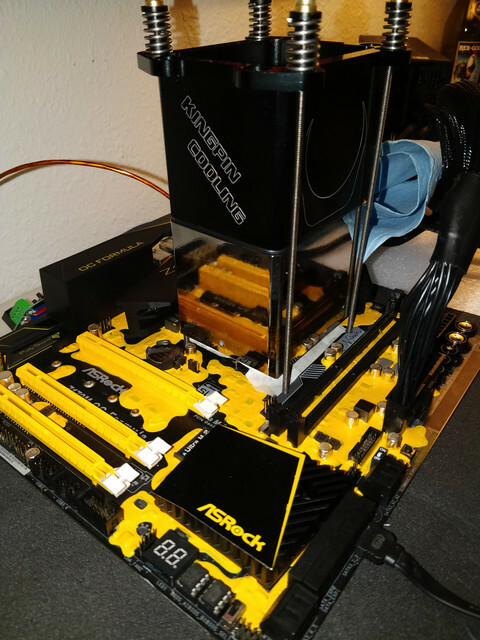 There is also a new top for Threadripper which I can give you info on as well. Compression is minimal with these O-Rings. So I can't see it being a problem if you're cranking down the thumbscrews. Let me shoot you a PM. I can mail off some to you as well to check out. The O-Rings Richie sent fits perfectly, once the pot is in place it shoudn't have any issues sealing but an actual test needs to be done to confirm this. However with his prior testing of the Venom pot and this being the same size where the O-ring itself is I don't forsee any problems beyond what Richie ran into. However a matter of what boards you can use it for it another thing - I can already say you won't be using it with for example a Socket 775 REX, the socket area is just too small for it to sit on the CPU because it's too large of a footprint for some boards. In the case of a REX it would be sitting on the surrounding components (Caps) around the socket area of the board before it gets to sit on the CPU lid. Took a few pics for reference to show just how massive the pot's base really is - You'd have to look and compare what you see to what you expect to use it with. ATM I'm settng it up to run with an Ultra D board but had to relocate one of the caps to the backside of the board for this very reason but at least it will work that way. Mind you the pot itself is HEAVY and I'll have to set something underneath the socket area to help support it due to the weight of the pot. They are nice and tight and I dont foresee there being any issues. I have a friend coming to town tomorrow for LN2 action, so we will put them to use and see how they holdup with a few hundred liters of LN2 on them. So I have a little update. At some point during the LN2 session, the O-Ring popped out on the sides. I imagine this would not happen on Dry Ice and the O-Ring is not needed for LN2, so I don't see this being a problem. Working good for me on the TRex. Stood in its place the whole session. Today I used it again for single core Benchmarks. Dont know if there are beneficts using LN2. Awesome! This is good news all around. I'm guessing the EPDM might become stiffer under the extreme cold of LN2. Might have contributed to it's sliding out? But it's not needed for LN2. Thank You mllrkllr88 and Kryton for testing the O-rings I sent. 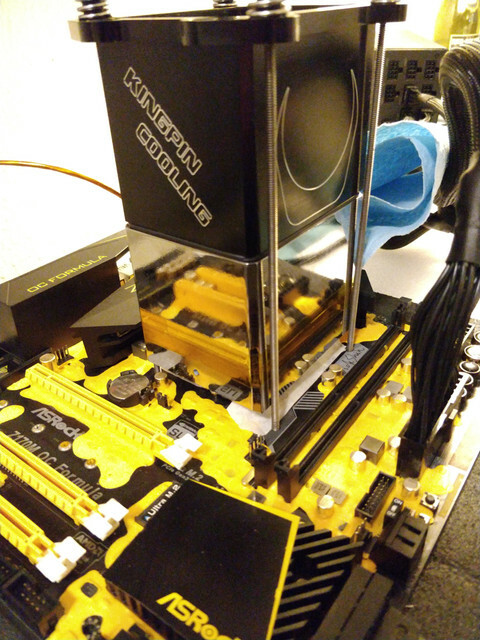 Overclock.net - An Overclocking Community > Cooling > Specialized Cooling > Dry Ice/ Liquid Nitrogen > EPDM O-Ring for KP Venom POT/DICE Working.